beneath where we, in tanks, rattle through dust. clean of bloom from bullet holes and shrapnel. by belt leather to the freedom of his doorframe. Michael Loruss is a native Californian, a veteran of the United States Army, and an alumnus of Berea College, where he studied English literature. 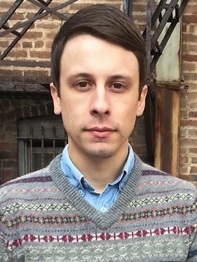 Currently, he is an MFA candidate in creative writing at Hollins University, and serves as assistant editor for The Hollins Critic. He is a coordinator for One Night Standing—a community reading series in Roanoke, Virginia—and is founding editor of DIALOGIST (a forthcoming quarterly journal of poetry and art), as well as assistant poetry editor for Impeachable literary journal. His work has recently been featured in Guernica, and is forthcoming in PANK, No. 8.